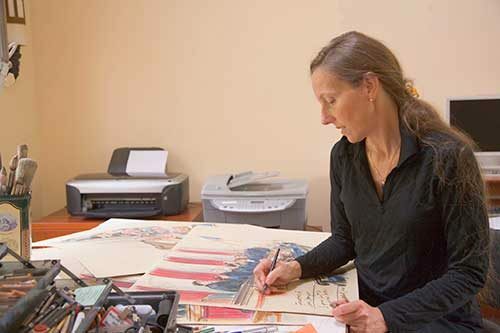 Dana Verkouteren is an internationally known courtroom artist whose work has appeared on several television networks including CNN, ABC and FOX. Dana is also renowned for her Maryland caricature sketches and portrait work. A distinguishing pen stroke and knack for capturing an individual’s personal vitality, make her one of the most sought after portrait artists. When not sketching, Dana teaches yoga and is involved in various health and healing practices. Over her long artistic career, Dana has developed keen abilities to discern people’s emotions and expressions. Being attuned to subtle facial and body movements, Dana uses her intuition by tuning in and teaches people to reduce stress through awareness of muscle tension and breathing patterns.